Heera’s Minced Ginger-Garlic is an indispensable ingredient in the Indian kitchen. It is called for in most recipes and is a healthy addition. This handy paste bottles the goodness of fresh ginger and garlic and is a real time saver, saving you the trouble of chopping, grating or grinding. Internationally too it is used in both vegetarian and non-vegetarian dishes to enhance the flavour of the dish. 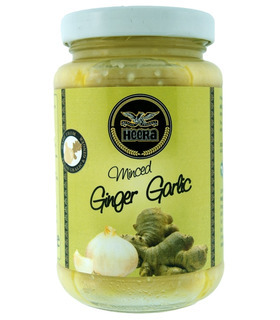 Once opened, Heera’s Minced Ginger-Garlic needs to be refrigerated and used within 2 weeks. 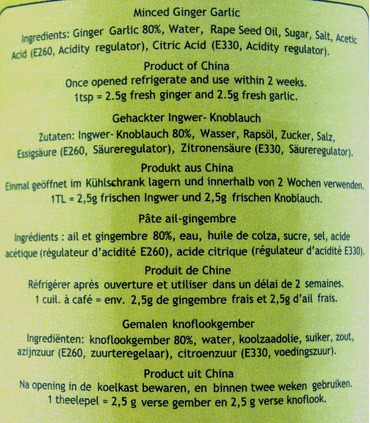 One teaspoon contains 2.5g of ginger and 2.5g of garlic. Health Benefits - Garlic is not only a powerful flavouring agent, but also has numerous health benefits. It has anti-inflammatory properties, is considered useful in treating / preventing health conditions like high blood pressure, heart diseases, colds, high cholesterol etc. - Ginger is said to helpful in improving digestion and blood circulation, fighting nausea, colds etc. Heera’s Minced Ginger-Garlic is an indispensable ingredient in the Indian kitchen. It is called for in most recipes and is a healthy addition. This handy paste bottles the goodness of fresh ginger and garlic and is a real time saver, saving you the trouble of chopping, grating or grinding. Internationally too it is used in both vegetarian and non-vegetarian dishes to enhance the flavour of the dish. 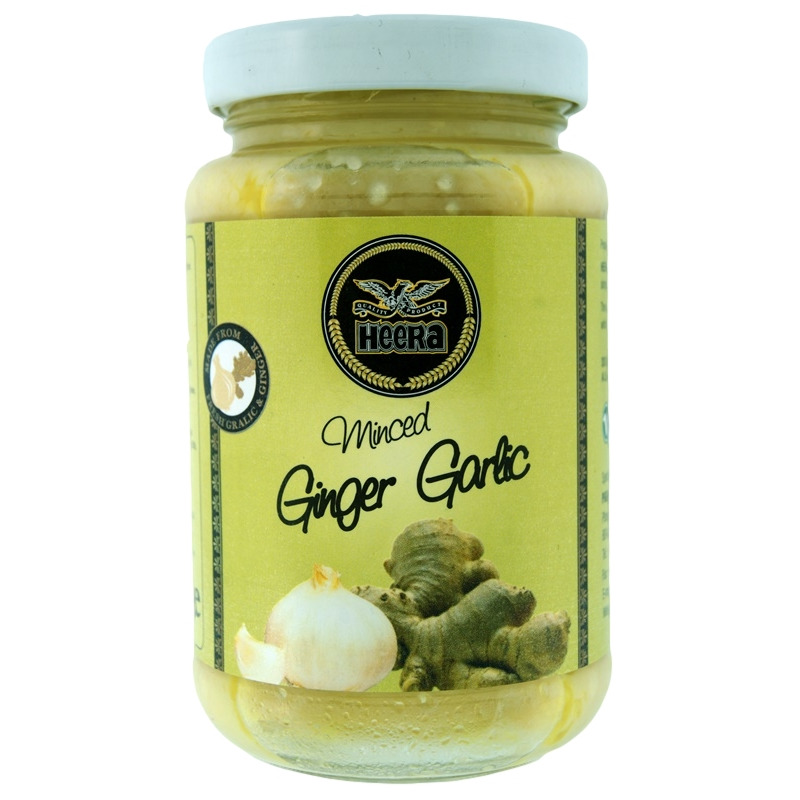 Once opened, Heera’s Minced Ginger-Garlic needs to be refrigerated and used within 2 weeks. 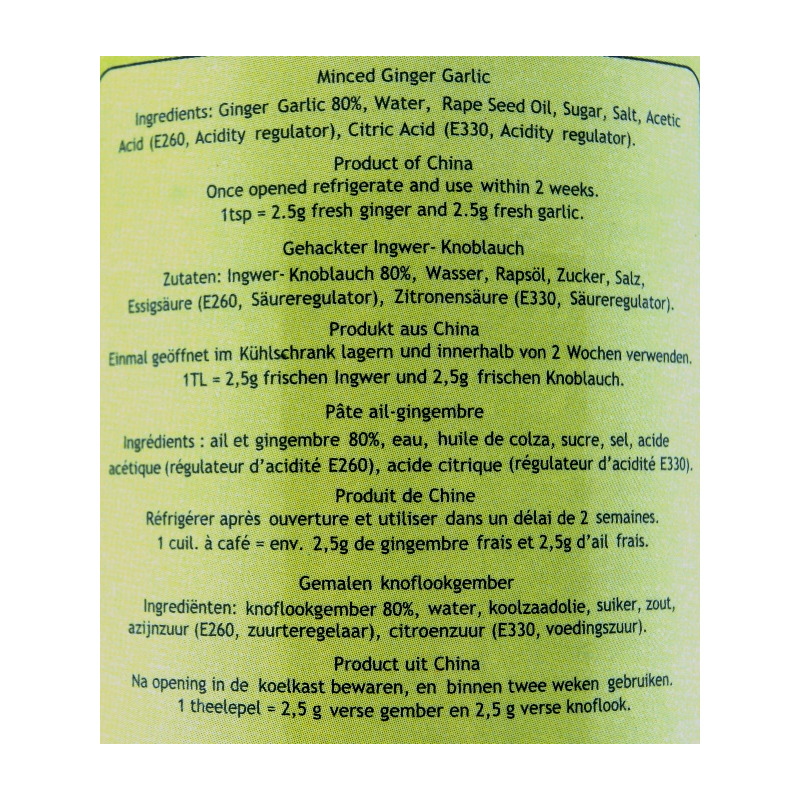 One teaspoon contains 2.5g of ginger and 2.5g of garlic. 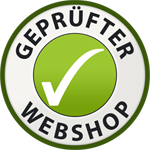 - Garlic is not only a powerful flavouring agent, but also has numerous health benefits. It has anti-inflammatory properties, is considered useful in treating / preventing health conditions like high blood pressure, heart diseases, colds, high cholesterol etc. - Ginger is said to helpful in improving digestion and blood circulation, fighting nausea, colds etc. Garlic, Ginger, Sunflower Oil, Salt.